With the introduction of the 750 Workmate Hardtop this summer, Surtees is adding more space and a bigger fishing experience to an already popular series. A larger version of the 700 Workmate Hardtop, the newest model to the range provides the same level of protection from the elements, but with even more usable fishing space. With 19 rod holders, increased storage and deck space, the 750 Workmate Hardtop is built to accommodate – allowing fishing experiences that can be shared with all the family and friends. 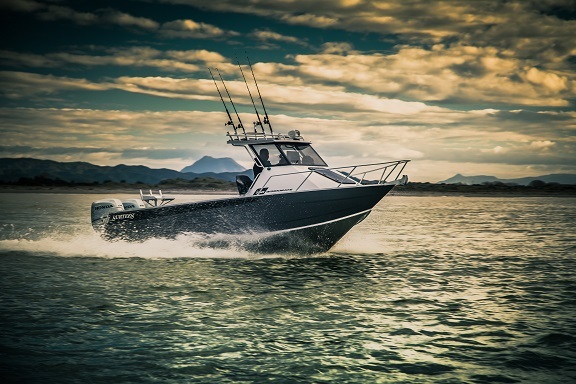 Despite its increased size, the 750 Workmate Hardtop retains Surtees’ focus on superior handling, with a patented Razortech™ super smooth riding hull and Anti-roll™ Stability Ballast Technology for the perfect fishing platform. The 530L capacity ballast offers the flexibility of a lightweight vessel at launch, with the ability to add weight from the ballast for stabilisation when out on the water. This additional weight can be locked in with the Anti-Roll Lock™ shut off gate for additional stability when underway. SiQ technology comes as standard, with safety at the forefront of every Surtees boat. Tough Deck™ provides one of the strongest hull designs in the world with two fully sealed safety buoyancy compartments, for complete confidence when out on the water. Combined with a 10-year hull warranty, the handcrafted Surtees 750 Workmate Hardtop is available with a wide range of customisable options allowing fishermen to personalise the craft to their individual style and requirements.